Peptide CMIEWPEHPNRTYEK, corresponding to amino acid residues 180-194 of rat NK1 receptor (Accession P14600). 2nd extracellular loop. Homology Mouse - identical; human - 13/15 amino acid residues identical. Preadsorption Control 1 µg peptide per 1 mg antibody. 1-4. Anti-Neurokinin 1 Receptor (NK1R) (extracellular) Antibody (#ATR-001), (1:200). 5-8. Anti-Neurokinin 1 Receptor (NK1R) (extracellular) Antibody, preincubated with the control peptide antigen. 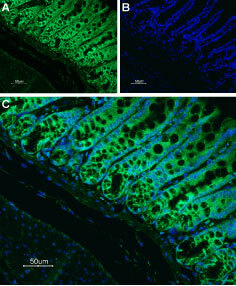 Immunohistochemical staining of rat colon paraffin-embedded section using Anti-Neurokinin 1 Receptor (NK1R) (extracellular) Antibody (#ATR-001), (1:100) followed by goat anti-rabbit-AlexaFluor-488 secondary antibody. A. NK1 receptor labeling appears in the tubular glands of the mucosa layer. Note that the smooth muscle and lamina propria do not stain. B. Nuclear staining using DAPI as the counterstain. C. Merged images of A and B. ___ Cells + Anti-Neurokinin 1 Receptor (NK1R) (extracellular) Antibody (#ATR-001), (5-10 µg/1x106 cells). Cell surface detection of NK1 Receptor in intact living rat pheochromocytoma (PC12) cells. A. Extracellular staining of cells using Anti-Neurokinin 1 Receptor (NK1R) (extracellular) Antibody (#ATR-001), (1:50) followed by goat anti-rabbit-AlexaFluor-594 secondary antibody (red). B. Merge image of A and live view of the cells. Pennefather, J.N. et al. (2004) Life Sci. 74, 1445. Hershey, A.D. et al. (1991) J. Biol. Chem. 266, 4366. Gerard, N.P. et al. (1993) Regul. Pept. 43, 21. Caberlotto, L. et al. (2003) Eur. J. Neurosci. 17, 1736. Munoz, M. et al. (2011) Expert Opin. Ther. Targets 15, 889. Ebner, K. et al. (2009) Curr. Pharm. Des. 15, 1647. May, A. and Goadsby, P.J. (2001) Expert Opin. Investig. Drugs 10, 673. Palecek, J. et al. (2003) Neuroscience 116, 565. Substance P (SP), Neurokinin A (NKA) and Neurokinin B (NKB) are all peptides belonging to the Tachykinin protein family. These three peptides, which demonstrate quite a heterogeneity in their distribution, exert their effect via three receptors: Neurokinin 1-3 receptors, members of the G-protein coupled receptor superfamily. However, Neurokinin 1 (NK1) receptor preferentially binds Substance P, Neurokinin 2 (NK2) receptor to NKA, and Neurokinin 3 (NK3) receptor to NKB1. Neurokinin receptors are distinguished by their seven transmembrane domains, an extracellular N-terminus and a cytosolic C-terminal. An unusual property of these receptors is the presence of introns as part of their structural organization1-3. Tachykinin receptors undergo alternative splicing. For example, NK1 receptor is detected with different C-terminal lengths. The longer receptor isoform is found in the brain whereas the truncated form is mostly detected in the periphery1,4. Due to the broad expression profile of tachykinin peptides, their respective receptors are also expressed in a similar fashion. NK1 receptor is widely expressed in neurons, endothelial cells, muscle and immune system cells. NK2 receptor is broadly expressed in the periphery and its expression in the brain is quite restricted. NK3 receptor on the other hand is largely expressed in the central nervous system and is also detected in the uterus, skeletal muscle, lung and liver1. Neurokinin receptors have been found in many pathophysiological indications and have therefore become targets for the development of pharmacological compounds. Such indications include cancer, psychological disorders, migraine and various inflammations, just to name a few5-8. Anti-Neurokinin 1 Receptor (NK1R) (extracellular) Antibody (#ATR-001) is a highly specific antibody directed against an epitope of the rat protein. The antibody can be used in western blot, indirect live cell flow cytometry, and live cell imaging applications. It has been designed to recognize NK1 receptor from rat, mouse, and human samples. Yuan, M. et al. (2019) CNS Neurosci. Ther. 25, 123. Anti-Neurokinin 1 Receptor (NK1R) (extracellular)-ATTO-488 Antibody (#ATR-001-AG). Anti-Neurokinin 1 Receptor (NK1R) (extracellular)-FITC Antibody (#ATR-001-F). This FITC-conjugated antibody can be used to detect NK1 in live cell flow cytometry.